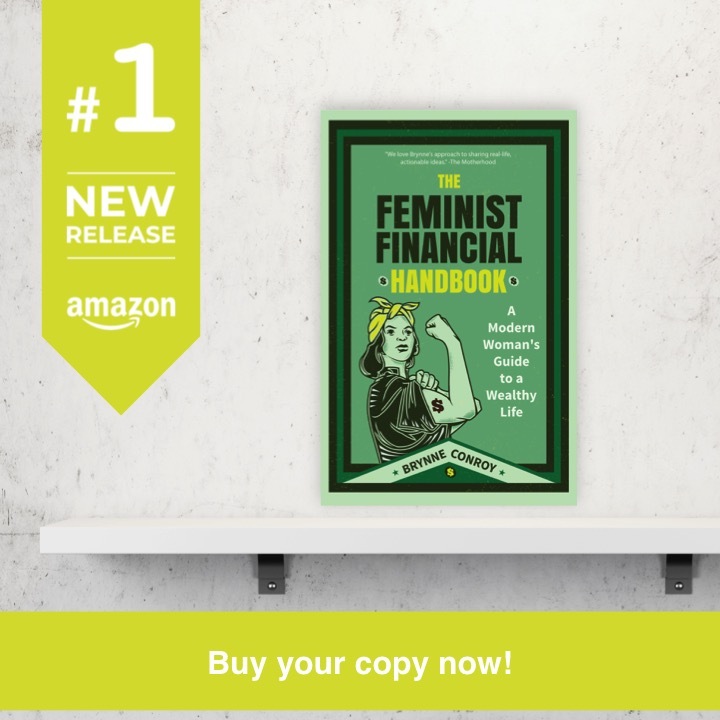 Welcome to the new home of Femme Frugality! New address, new layout, same content you’re used to. I’m glad you found your way! You can sign up for email updates in the corner, and for all those new followers be sure to follow on Twitter! Much love to Matt, Daisy, Chris and Michelle for helping me figure out how to make the switch! A couple of weeks ago I went to the Ohio Valley Bloggers Meet & Greet at Ikea here in Pittsburgh. It was my very first blogging event, and I had no idea what to expect. I was the only PF writer going. The rest were mommy and lifestyle bloggers. But I went. And it was actually really fun. We played a version of get-to-know-you Bingo and then did a photo scavenger hunt all over the store. There were a couple of raffles, and we exchanged business cards accompanied by candy. Pretty much everyone there made their little gifts and business cards super cute (there were a lot of DIY bloggers,) and then there was me with hole punched 100 Grands tied to my business card with a white piece of yarn. There were a few conversations going on about how people didn’t want to write themselves into a niche; they wanted to write about whatever they wanted to write about at all times, and if they tied themselves down to a specific niche their readers may feel violated after an off-topic post. This flies in the face of all the advice I’ve heard in the PF community, but some of these ladies are pretty successful. So there’s something to look into. We also got swagbags to take home. And holy moly they were amazing. 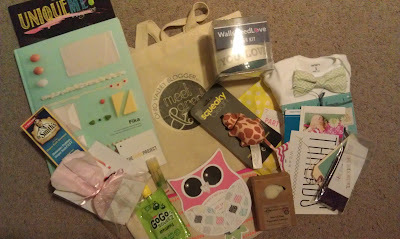 I wouldn’t recommend going to a gathering of bloggers who are mostly mommies if you don’t have kids simply because of the swag, but I do have kids, and Natalie got some amazing sponsors. 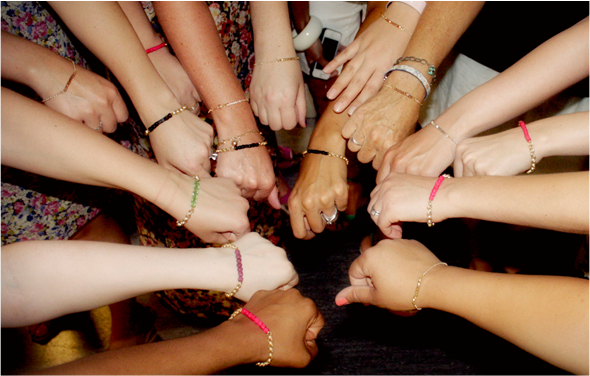 The kids that make the bracelets are at-risk youth. By making and selling the jewelry, they are able to earn their way through college via Threads. It’s really a pretty amazing company and some really pretty jewelry. You can read more about their mission here. Even more amazingness: they’re giving our readers (that’s you) 20% off their order. To redeem, simply use the code “blogger” at check-out. Here’s the shopping part of their site. All you bloggers out there–have you ever been to an event? What was your experience? This entry was posted in Think on August 5, 2013 by femmefrugality. I absolutely LOVE the new site design! It really looks great! I LOVE the new site!!! Much cleaner and easier to read! Glad you had fun at the blogger meetup. We just had a mini socal pf meetup as well! Thank you! And very cool! Sometimes I feel isolated from PF bloggers IRL. If anyone’s in Pittsburgh let me know! Thank you! And that sounds very cool! I’m so glad it’s held up! Thanks! It was a lot easier to redesign than I was anticipating. And the event was a ton of fun! Thanks for your tweet!! Nieecce site design. Fresh and fun. I have never gone to a blogging anything, which I should probably look into from a networking perspective. Did you feel that the connections you made will ultimately help you blog grow? Thank you! And you know what, I think it’s all about how you handle it. Meet a ton of people while you’re there. That’s easy. But you’ve got to be willing to follow up and interact with people afterwards, too. I’m trying to do this second part. Partially because of the desired growth, partially because everyone was just really cool. We’ll see how it pans out. Thank you, Sicorra! And it was! I’m glad you made the switch. Looks great! Thanks so much, Michelle! And for all your help! You did it! It looks great! I love the new design! I’m so proud of you!!! I love the new look. Is this a WordPress blog? Do you have help? Thanks! I am using the WordPress platform. I got a TON of advice from the people linked to in that first paragraph, but I did the migration and design myself. Still working on the blogroll (want to find something that accesses people’s feeds so it’s fair,) and have to adjust a few hundred pictures in past posts. Other than that, it was a lot easier than I expected. Congrats on getting the site moved over! Everything looks great. I have yet to go to a blogger event but I like that yours wasn’t just PF bloggers. My guess is that we can get a little insulated and would definitely benefit from other ideas and opinions. Thanks a ton! And it was kind of cool to see other perspectives. So how are you liking wordpress so far, site looks great. Glad we were able to help. From the looks of it you did it pretty fast. I remember doing my first site design and it took me 40-50 hours to get a rough rough shaped site. My first logo was a copy and paste with some special effects in MS Word. Really like the new site and really enjoy hearing about kids doing things to better themselves. Glad you enjoyed yourself at the blogging event. I need to get some business cards made now that I think of it. Thanks, Thomas! When I was in the market for business cards (read 2 weeks before this event,) Staples had a sale going on: $9.99 for 250 cards with no shipping. Can’t say I’m incredibly impressed with the print job, and now my URL has changed, but it got the job done. Your new site design looks cool and I liked those bracelets. Good to know that you had fun in the event. I love your new blog design – it’s so fresh and clean looking. I have never been to a bloggers event but I would love to go. It would be amazing to meet the people I interact with everyday in person! Thanks so much, Alexa! The event was totally fun. I guess I’d have to go to FinCon to get the PF experience. This sounds like a ton of fun. It would be so cool to actually meet many of the bloggers that I frequently interact with. OMG haven’t commented in awhile, but the site looks awesome!!!! It’s fun to watch blogs change and grow =) Glad to be a longtime reader. Aw, Erika, I’ve missed you! How is law school going? Sounds to me like you could fall under that ever encompassing category of “Lifestyle” blogger. I’m actually going to have a few of these ladies in a post in a couple of weeks…they might be good people to contact per success in that niche! Thanks, Monica! And it really was. Good times. Wow, a blogger event! That sounds like great fun! I wish there was an opportunity like that where I live (in the UK). Maybe one day there will be. I really like your new design too! It was super fun! Hope one comes your way soon! And thank you! I’m really liking the new layout and congrats on making the switch! Sounds like the blogging event was really fun, I would love to go to one someday. Thanks! And you really should! Was a ton of fun! I LOVE the look of the new sight. Bright and clean…just perfect! I think it totally suits you!